First, installed Neo4j from instructions at http://debian.neo4j.org/ and installed the RNeo4j R package. Then pointed the web browser at http://localhost:7474/browser/ and did the password configuration. The Neo4J query browser tool is absolutely lovely! Can view data in tabular form or as a network visualization. Loaded the libraries in R, and opened a connection to the database. Load some example data. This is my go-to example of the McFarland classroom data of time-stamped continuous time conversation interactions. ##  "active"       "data_id"      "gender"       "na"
For this network, onset and terminus are the same timestamp, so should be easy to model very literally in the database. Create vertices/nodes for the network in the database. There must be a way to load more than one vertex at a time? Need to store the 'node' objects in an array so we can use them to construct the edges later. Now load the edges into the database. Use the tail (from) and head (to) vertex indices to look up the appropriate node object in R. Also store the onset time of the event as a property of the relation. Probably just pull the nodes out with the query, but not yet sure how to impose the correct ordering to ensure they match up. Now query the edgelist and peek to see that it worked. I like that the Cypher language queries are built almost by 'sketching out' the chain of relationships I'm interested in. So a directed relationship is (vertex)-[edge]->(vertex). Its a networkDynamic object, so we can easily make it into an animation. In the example above, I'm working with a network of instantaneous events, so its possible to model it with each 'edge-spell' in networkDynamic becoming a separate 'relation' with an onset property in Neo4j. The nodes and edges in the R network object roughly correspond to the nodes and edges in the Neo4J representation. It will be a bit more complicated if I want to have a single relationship with multiple activity spells associated with it. Can this be done by introducing multiple relation types, linking from vertices to edge, and from edges to edge_spells? A temporal model like this is proposed in https://github.com/SocioPatterns/neo4j-dynagraph/wiki/Representing-time-dependent-graphs-in-Neo4j (http://dl.acm.org/citation.cfm?id=2484442) but I dont think it is necessary to go to that full level of complexity. Also it is assuming a mapping of edges and vertices to 'frames' (probably would be slices or a network sequence in networkDynamic?) which might be tricky when working with continous time data. Need a dataset where edges have durations to try this out. Load the discrete time simulation dataset from the ndtv package. Now constrct the mapping in the database. First create the database nodes for the network's vertices. 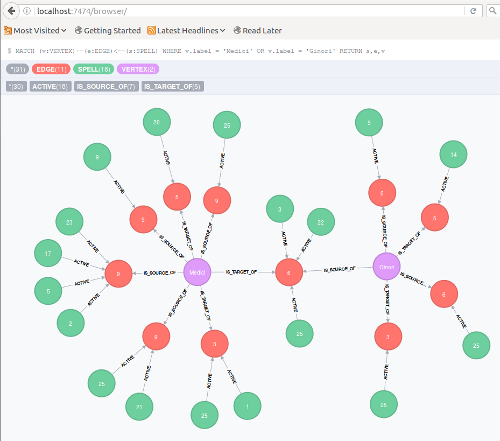 Can now take a peek at this in the Neo4J query browser, showing just two of the original network vertices to get a better understanding of the data model. The lovely graphical query browser plotted the spells in green, edges in red, and vertices in purple. I'm gonna skip creating activity spells for the vertices, since in this network they are always active. But it should now be possible to query a time range and reconstruct a graph by selecting the spell nodes by their activation times, and then the associated edges and their vertices. I can also pull the VERTEX nodes if I wanted data attached to them (label, etc) instead of using the properties I attached to the edges. Neo4J + R = cool!